And so another summer has come to an end. I have a tinge of remorse that I didn't do as much with summer produce that I had planned to. I wanted to explore eggplant and tomatoes more than I did. I didn't buy one avocado at the farmer's market nor did I ever give in to the temptation of squash blossoms. Although in my defense, what else is there to do with squash blossoms, other that stuff them with ricotta cheese and then fry them? I didn't make as many salads as I have in the past and I whenever I bought any stone fruit, more often than not, while waiting for them to ripen, they'd go from being as firm as a tennis ball to having saggy, wrinkled skins in only a day or two. Most of them wound up in the garbage. Not wanting the summer to be a complete missed opportunity, I was determined to do SOMEthing with one of my favorite vegetables of the season - corn. There was still plenty of corn to be had at my local farmers' market and the neatly stacked piles of ears cloaked in chartreuse jackets lined in silk was too much to resist. But what to do with the bounty? I considered corn pudding, but it seems more like a side dish, doesn't it? Rather, I wanted the corn to take center stage. Weather-wise, it's been quite nice in Los Angeles, warm during the day, cool at night, and it was that coolness that informed my decision. 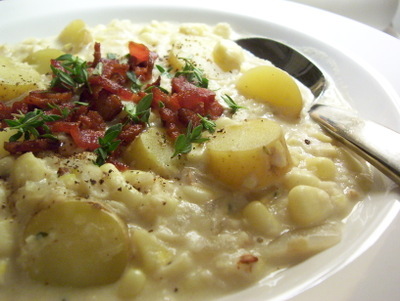 Corn chowder! Of course. It makes so much sense. 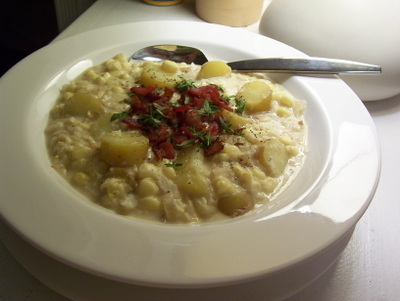 Corn in the form of chowder is the perfect thing to make during this brief window where is not quite summer anymore yet it's not really fall, either. The recipe I settled on comes from the August 2007 issue of Cooking Light. Since, Mark was out of town at the Toronto Film Festival, I would have the chowder all to myself, an easy meal to reheat for the next couple nights. However, the results were so satisfying, I sort of wanted to share them, which is very unlike me. What is very like me is the fact that I simply couldn't wait until he got home and by the time he did, I had gluttonously devoured most of the chowder, leaving behind only a few meager spoon fulls. On a whim I decided to make another batch, this time to share, as painful as that may be. Although this time I changed the recipe a little. Cooking Light wants you to puree a couple ladle fulls of the soup in order to thicken it. I decided that this time I would use flour (closer to the classic method) and instead of using equal parts 2% milk and heavy cream, I just used all heavy cream. I mean, it's chowder after all. Chowder needs to be thick and rich. But don't worry, there is still a good amount of stock in the soup so it all balances out. It's not that bad for you. Cook bacon in a large pot oven over medium heat until crisp. Remove bacon from pan and drain on paper towels. Add butter and onion to drippings in pan and cook 8 minutes or until tender, stirring occasionally. Add the flour and stir to coat the onions. Continue to cook until the flour has turn a very pale, golden color, which should take a minute or two. 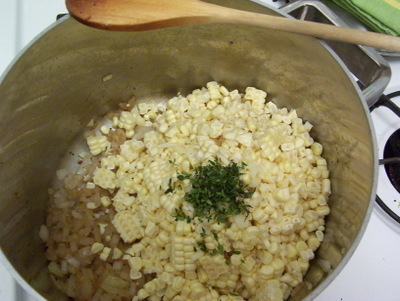 Add the corn, chopped thyme, cayenne pepper, and garlic to pan, and stir to combine. Cook for 30 seconds, stirring constantly. 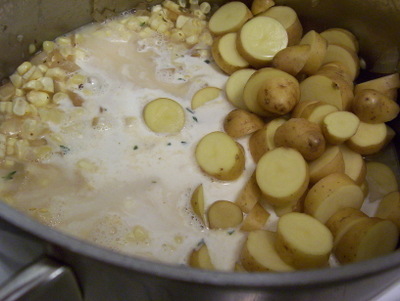 Stir in broth, cream, and potatoes. Cover, crank heat to high and bring to a simmer. 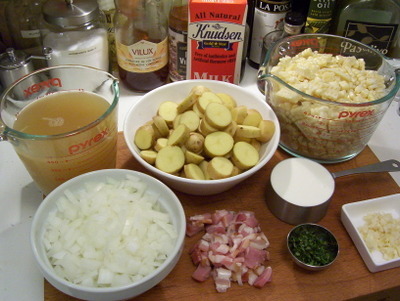 Reduce heat medium low and cook 10 to 15 minutes or until potatoes are tender and the broth has thickened, stirring frequently. Season with salt and black pepper. To serve, ladle into bowls and sprinkle with the reserved crumbled bacon and thyme leaves. Between the two methods, I have to say I prefer thickening the soup with flour, rather than pureeing a ladle full of the corn and potatoes. The soup base is thick and velvety which is contrasted by the sweet, crisp burst of the fresh corn kernels. It would never be this good using frozen corn, so don't even try it. The potatoes are tender and the bacon adds crunch and brings out the smokiness of the rendered fat the onions were cooked in and the thyme is fragrant and peppery. Personally, a chowder doesn't seem quite complete without a few shakes of Tabasco at the end. Alternately I would think the soup would be great with a swirl of basil pesto and a dollop of creme fraiche at the end, instead of the thyme. Oh, good -- I clipped this recipe but haven't made it yet. How do you thicken with flour? Was tasty. Stuck to the recipe with a few minor difference. Generic store bought bacon requires about a strip per person for one topping. Also added diced green chile, being from the southwest, as well as a small breast of shredded chicken. :) Nom nom. Holy crap this is good stuff. I threw this together about a half hour ago so I could re-heat for a quick family dinner tonight, but couldn't stop myself from eating a bowl for "brunch" right now as I type. Didn't have cream so used milk instead, and swirled in about a tablespoon of cream cheese to the bowl of hot chowder before sprinkling on the bacon, etc. To anyone who's always on the lookout for fast + easy + + tasty meals: put this on your menu. Seriously. Personal taste variations are endless. Thanks again Grant. This was divine! Used regular store-bought bacon as well, and had to sub red creamer potatoes for fingerling... but the bf and I loved every bit of it! I can't wait for the bit of leftovers tonight! I like the potatoes because contain protein and many properties that help us to creat too much energy and this is the main reason why we need to eat it. I love potatoes very much especially finger potatoes. And this summer preparation gonna be my next favourite one.http://www.youtube.com/watch?v=ds8xyK-r65M Looking so colourfull and thanks for the simple mehtods and keep on posting more stiffs.